I remember how, only a few weeks ago as a train thundered through France, a woman sitting opposite to me in the dining car said “The English”. I looked through the window over the green fields, and saw row on row, sharply white against the green, rising with the hill, and dropping again into the hollows – keeping a firm line as they had been taught to do – a battalion on its last parade. Because of the scale and chaos of the battlefields at the end of the war there were staggering problems for those trying to recover the bodies of the dead and give them a secure and identifiable resting place. We know how well those responsible succeeded in their task. Seeing the tranquil well-tended gardens in which the armies of the dead lie it might seem now that it was always accepted that the majority of those who had died would remain where they had fallen on the battlefields of the Western Front. But history, as always, is more complex than that. The Americans, for example, on entering the war, had pledged to bring back any man who might be killed in action. Congress had appropriated over $8 million, or roughly £250 a body for the purpose, and was also willing to pay $650 dollars to any war mother or widow who wanted to travel to Europe to visit a grave. Eventually, around three-quarters of those who died were returned. Stephen Graham, visiting the devastated regions in 1920, while writing The Challenge of the Dead saw huge stacks of boxes on the quay side at Calais: “At great cost of time and labour the dead soldiers are being removed from the places where they fell and packed in crates for transport to America.” There were some unfortunate errors caused by this grim undertaking. Problems over identification were not uncommon, and it was said that more than one US citizen who had returned home from Europe alive and well was shocked to be instructed to go and fetch his own body from the local depot. After the Great War eight American military cemeteries were established in Europe, two in Belgium, five in France, and one at Brookwood in the UK; containing a total of 31,000 American war graves. Initially it had been planned to mark each grave with a white marble cross, but in 1927 pressure from the organisation of Jewish War Veterans brought about a change in the law and the American Battlefield Monument Commission was obliged to place Star of David markers on the graves of Jewish soldiers buried in war cemeteries in France. The French of course, had mostly died defending their own country from the invader, and so technically could not be repatriated. France is a large country, however, and there were many bereaved parents and wives living great distances from the devastated regions who wanted their sons and husbands brought back to their home town or village. Emotion was on their side, but so was logic. The living had done their duty and had been demobilised and allowed home; it would be unjust to deny the same rights to their dead comrades. At first the authorities were inclined to go along with those who took the opposite view, namely that the soldiers should stay on the battlefields where they had so nobly died for their country. 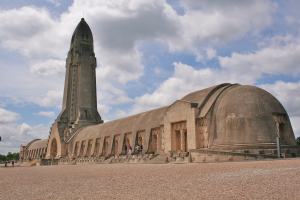 The French government declared that it was more fitting, and fairer to the thousands whose relatives had no known grave, that the dead stay where they were, and initially turned down any request for repatriation. They were in favour of grand gestures like the astonishing ossuary at Verdun. Here are displayed the bones of thousands of French soldiers reclaimed from battlefield graves, though there are doubts whether it would have been possible to completely distinguish German from Frenchman on that battlefield. It has been claimed that during 1916 at least 1,000 soldiers died for every square metre of that shell-blasted, blood-soaked and now barren land. But it proved to be impossible to stop private enterprise taking over in the matter of repatriation. There was an undignified trade in dead heroes, when parents made private deals with gravediggers to exhume their sons, then brought them home secretly. This form of bribery was not open to poor parents, who often, when they did manage to scrape together enough money to pay for the long journey to visit their son’s grave were distressed to find the ground churned up, and the cemetery in a general state of chaos. Eventually, in September 1920, the French government gave in, and bereaved families were given the legal right to bring home the bodies of their loved ones at state expense. The process did not always run smoothly. There were frequent disputes over identification of a particular body, or battles for ‘custody’ of a dead soldier between parents and widows. By the end of 1923, however, some 300,000 French soldiers out of the million who had died in the Great War had returned home. 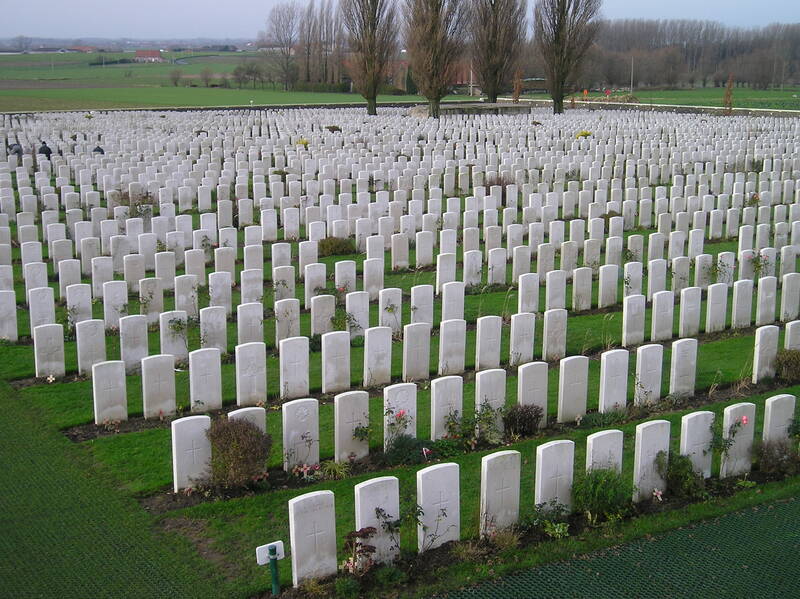 The British government had made no commitment about repatriating those who died in battle. Britain, after all, had always kept an army mainly for the purpose of defending the Empire, and military casualties were usually suffered far from home. There had never been much clamour before to have the glorious dead returned. This current war was rather different, though. Ordinary soldiers were no longer regarded as the scum of the earth; they were the sons of respectable families who had volunteered to do their duty for their country and for a King who even visited their battlefield graves (left). And as men who had died doing that duty, it was expected that their last resting places should be well-marked and cared for. In recent memory concern had been expressed both about the poor state of graves of men who had died in the Crimean War, and closer in time, if not closer to home, the neglect of the last resting places in South Africa of Boer War casualties. So it was important to get it right this time. Luckily, Fabian Ware , came on the scene very early in the war. He was a former editor of the London Morning Post and at 45 he was too old for active service, but in September 1914 he arrived in France in charge of a mobile Red Cross Unit. He and his volunteers did valuable work in marking and recording the graves of those killed, and in 1915 the importance of that work was acknowledged by the War Office setting up the Graves Registration Unit under his command. 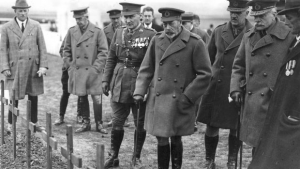 It was during those early days one particular incident probably contributed more than any other towards the eventual British approach to dealing with the war dead. Gladstone’s grandson, a Liberal MP in his late thirties, had joined the Royal Welch Fusiliers and was killed by a sniper at Poperhinge after (according to Robert Graves) unnecessarily exposing himself. General French seems to have taken heed of high-level pressure, and ignored Joffre’s order of March 1915 banning exhumations from battlefield graves. He ordered the 2nd Lieutenant’s body to be disinterred despite heavy enemy fire, and had it sent home for a military funeral. Ware realised that such action could only lead to increased demands back in Britain for repatriation of all the war dead, and he was already coming round to the view that it would be better if all the soldiers stayed together in death as they had in life. The Army was scarcely a democratic institution, but there was a genuine sense of unity, even comradeship between officers and men sharing the discomfort, danger, and horrors of the trenches. He managed to get the authorities to put out an order forbidding exhumations, partly on the grounds of hygiene, but also to prevent having to give in to pressure from powerful, or wealthy relatives of particular soldiers. 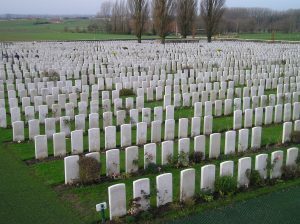 On 21st May 1917 the Imperial War Graves Commission came into being, to oversee the care of the graves of all members of the Imperial Forces who “died from wounds inflicted, accident occurring or disease contracted, while on active service whether sea or land.” By January 1918 the Commission was declaring that there would be no repatriation, since all soldiers, whatever their rank should “lie together in their last resting place, facing the line they gave their lives to maintain.” It would also, because of the huge numbers involved have been a ruinously expensive operation. 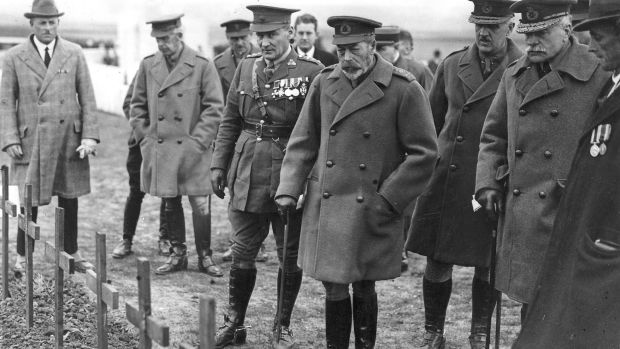 King George V entering Crouy Cemetery, France with Fabian Ware behind him to the right. Those men who had no known grave were to have their names recorded on memorials, and Rudyard Kipling was given the job of finding suitable inscriptions for the headstones and memorials. There was some unease about an author with no known religion taking on this “sacred” task, but he devised some unforgettable phrases, one of the more notable being “their glory shall not be blotted out” for those men whose recorded graves had been destroyed in a subsequent bombardment, a common occurrence during the 1918 March offensive. It is ironic that Kipling died still believing that the grave of his own son who went missing at Loos in 1915, had been similarly obliterated. In 1992 it was seemily discovered that Lieutant John Kipling’s grave had been there all the time, having being wrongly, and perplexingly, classified as belonging to an unknown British officer. (More recent research seems to indicate that the 1992 claim may have been incorrect). Protest over the Commission’s ideas began to grow. Many were critical of the design of the headstone, which was described by one woman as resembling a milestone. There were many, too, who were deeply upset that their sons could not have a cross over their graves. Some of those were quietened by the inclusion of the Cross of Sacrifice in all cemeteries, but there were increasing calls, echoing the French demand that the dead should be “demobilised”, for the boys to be brought home. The Spectator and the Daily Mail, in particular, ran fierce campaigns attacking both the Commission in general and Commissioners in particular. In May 1920 there was a debate in the House of Commons about the headstone design, and on the question of repatriation. Many of those MPs taking part in the debate had been serving officers, or had lost sons themselves during the war. It is hard not to feel sympathy with one member, Mr Turton, who said: “There are many of us who would have given all we possess if we had been allowed to bring our boys back to England and to put their bodies in the churchyard, where eventually we shall be laid ourselves, and where Sunday after Sunday we could see the grave.” In the end, though, it was agreed that the Commission’s way of dealing with the problem was, despite its shortcomings, the only realistic way of coping with the sheer numbers of graves, and commemorating the heroism and sacrifice of all those who had died. And so the work of building the “silent cities” of the Western front began.